Where is Villa Milagros? How far is it? What's the best way to get there? Villa Milagros is located in Community Village, Brgy. Manggahan, Rizal. Not to worry! It is only 14 km away from RiverBanks in Marikina, or 13 km away from Sandigan Bayan. There are three main ways to get there. We recommend that our clients and guests use Waze, a mobile phone application that monitors traffic and gives you directions on the fastest way to get to Villa Milagros. How large is the property? 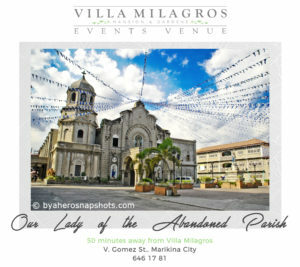 The total land area of Villa Milagros is one-hectare. As of the moment, only half of the property is accessible to clients. It is continuously being developed to give our clients more options on where their dream events will be held, like your garden wedding, your dream debut, or family or corporate gatherings. What are the different venues and what are their capacities? The North Wing’s recommended capacity is 150-200 but it can host up to 300 guests. This newly-built hall is considered as the Mansion's extension for it shares elegance and grandeur. Delia’s Garden is one of the magnificent gardens of Villa Milagros. Its recommended capacity is 100-200 guests but it can host up to 300 guests. Cristina’s Garden is another venue to choose if you want an intimate garden wedding or an event.Its recommended capacity is 80-130 guests but it can host up to 180 guests. The Liamzon Hall serves as the heart of the Mansion. This oval-shaped hall definitely fits your needs for a more intimate social gathering. It can hold up to 40 guests. You can use the Dining Room for free if you reserve this beautiful venue. Do you have bedrooms that the clients and their guests can use? 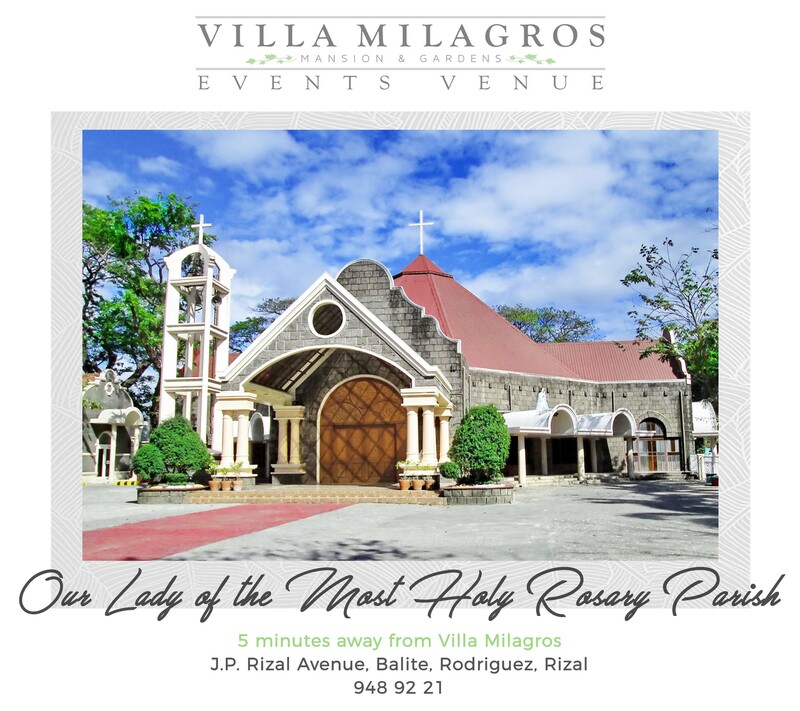 Villa Milagros has five (5) bedrooms that you and your guests can use — The Milagros Suite at the ground floor; Sonia, Corazon, Zeny, and Norma's Room which are located at the second floor. You can rent these rooms on-the-day of your event or overnight. Can we have fireworks during our event? For safety, we do not allow the use of fireworks. Nevertheless, you may use sparklers but make sure that all debris is properly disposed of. Do you allow multiple events in one day? 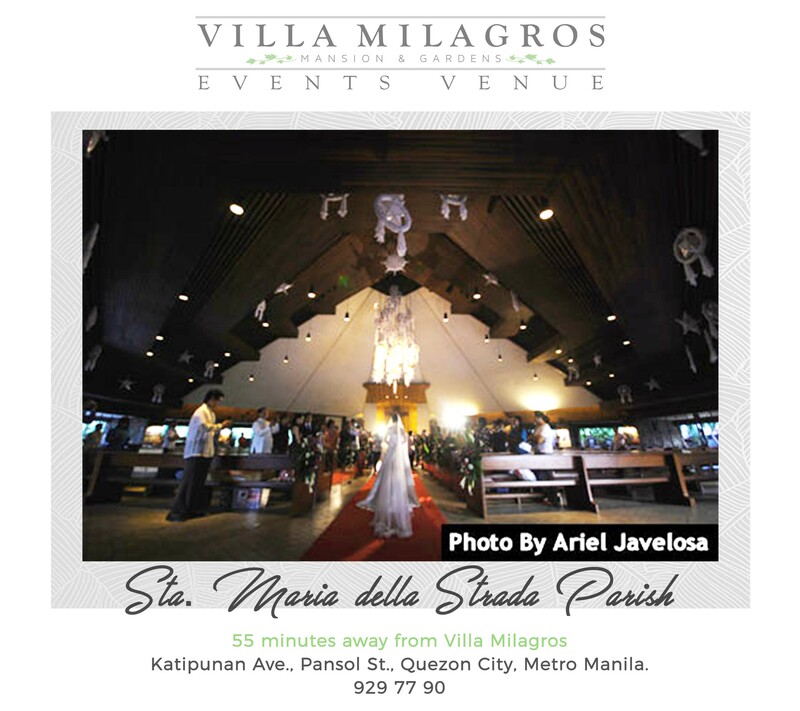 When you decide to have your event with us: be it a beautiful garden wedding, a grandiose debut or a private social function (even photo shoots and video shoots) —Villa Milagros is exclusively yours. We want you and your guests to enjoy the our place and keep your event private and secured. Can you pencil book me for my date? We do not pencil book. The deductible reservation fee guarantees the date of your event with us. 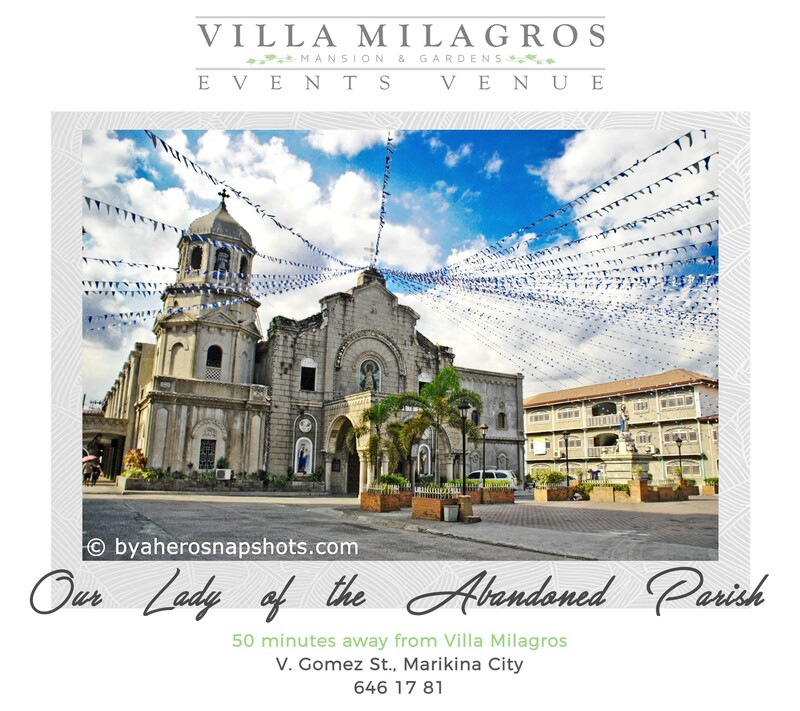 Can we do our engagement photo shoot in Villa Milagros Mansion and Gardens? Yes, you can! Talk to us now about how you can avail it. But if you will have your event with us, we can give you a 4-hour free use of our grounds for your shoot. However, it is only for first-come, first-serve basis only. 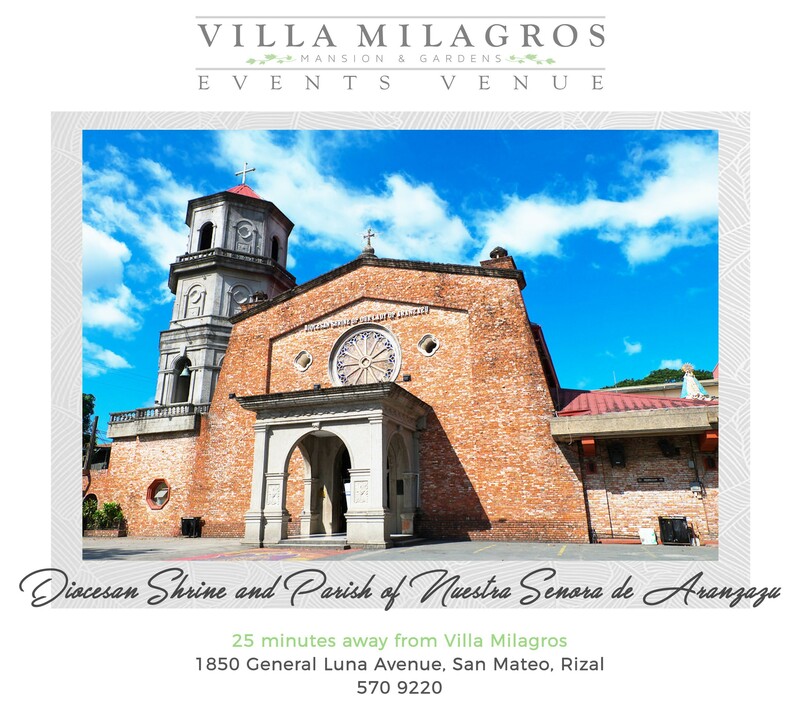 This is a way for us to thank our clients for having Villa Milagros Mansion and Gardens as the venue for their event. When will the 5-hour venue rental starts and do we need to pay surcharges if we go beyond the 5-hour rental period? Your 5-hour venue rental starts from the “invitation time” agreed as per Venue Rental Agreement that you will sign when you have decided to have your event with us. The fees apply for the first five hours between 8:00 AM – 11:00 PM. If you have exceeded the 5-hour period, you need to pay the additional charges. This regulation is strictly enforced by the company. Does your 5-hour basic event venue rental include ingress and set-up? No, your event venue rental starts on the hour of your "invitation time". This is the exact time we expect your first guest to arrive. Suppliers are allowed to Ingress and set-up 6 hours before the event. Pack-up and Egress must be completed 3 hours after the end of the event. When will our 5-hour use of the Milagros Suite start? You may choose when you want to start your use of the Suite. You can do it even before your invitation time. However, excess charges will apply after 5 hours. You must leave the room and surrender your key upon the agreed time for check-out. Is there a limit to the number of people who can stay at the Milagros Suite? A maximum of 12 people are allowed into the Milagros Suite, including guests and suppliers. What if I don’t use the adjacent terrace/garden, can I get a cheaper rate? Unfortunately, no. It is part of the rental, whether you will use it or not. All payments made to Villa Milagros are non-refundable, nonconvertible, and non-transferable. 100% penalty if less than 2 months before the event. Can I bring an outsider stylist for the venue? Yes, you may. However, we enforce strict rules when it comes to designing a portion or portions of the property for an event. We do this to ensure that no part(s) of the property will be damaged. Any damage incurred, you need to pay for it. 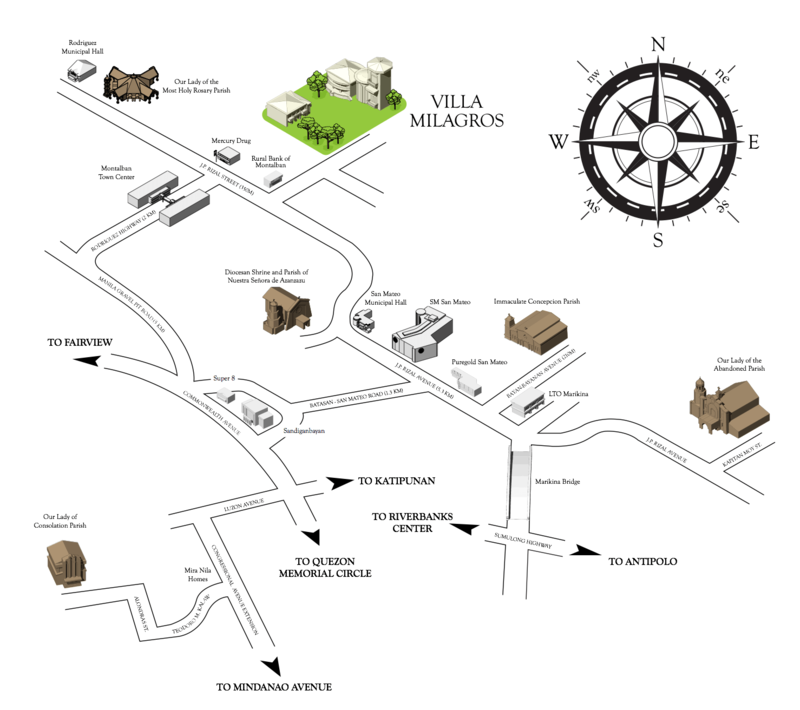 We offer free parking inside Villa Milagros. However, please secure your valuables for we will not be held liable for any losses. 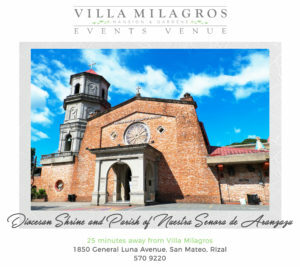 Can we have our food tasting at Villa Milagros? Yes, you may! We do host occasional food tasting at Villa Milagros. Talk to us now. 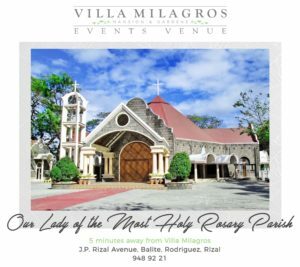 Can I hold my ceremonies at Villa Milagros? Yes, you may! You may also rent additional areas by the hour for your ceremony or cocktails. Contact us now for more information. If you are renting an outdoor venue and are worried about the weather, we advise you to rent a tent or better, book our indoor venues, the North Wing or the Liamzon Hall. We also have weather contingency insurance. Do you allow your guests to smoke at Villa Milagros or any part of the property? We are strict on implementing the use of our designated smoking areas inside the premises. What are my payment options and schedule? We accept cash and bank deposits. 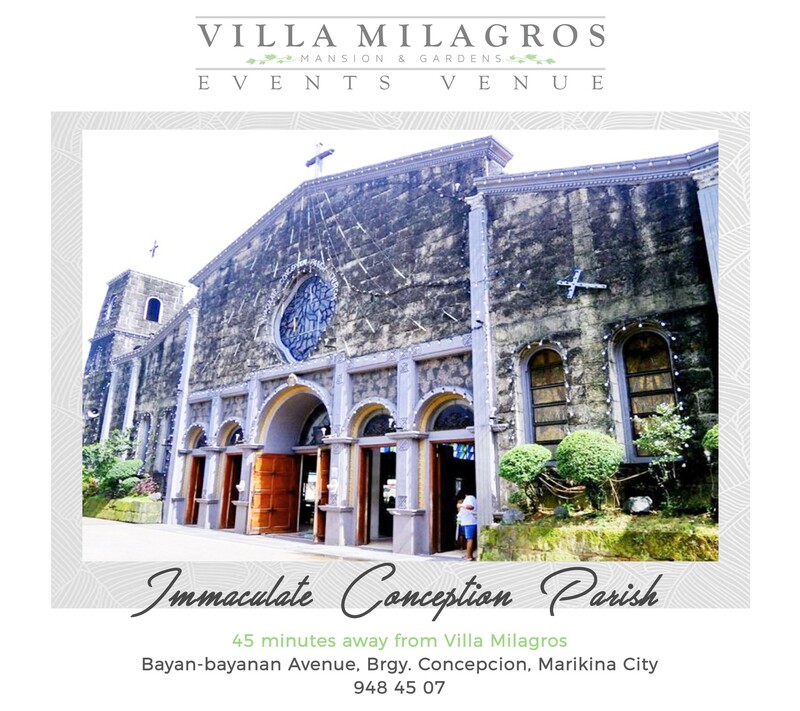 To reserve your date, we require a non-refundable reservation fee of P15,000.00. A security deposit of P20,000 and 50% down payment should be paid within 30 days after the reservation is made. The client must be fully paid of his/her guaranteed cost a month before his/her event. Where can I deposit my payments? Kindly contact us for the availability of your chosen date before you settle your payments. Interested in renting our place for your garden wedding or just to have more information about Villa Milagros Mansion and Garden? Contact us now and we will be happy to assist you.